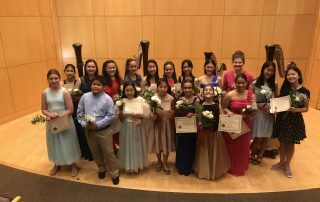 The next Young Artist’s Harp Competition will take place in July, 2020. Scroll down to join our mailing list and receive repertoire information when it becomes available. Note: The information below pertains to our 2018 competition and is provided here as a reference. The next competition will take place in July 2020. Repertoire will be posted summer, 2019. Please note that the competition schedule is tentative and can change based on the needs and flow of the competition. 6:30 p.m.: Emerging Artist and Preparatory Division check in begins. 7:00 p.m.: Mandatory meeting for Emerging Artist and Preparatory Division competitors and number drawing for performance order. 9:00 a.m. Emerging Artist Division competition begins. Afternoon (time TBD): Preparatory Division competition begins. 6:30 p.m.: New Artist check in begins. 7:00 p.m.: Mandatory meeting for New Artist competitors and number drawing for performance order. 9:00 a.m. New Artist Division competition begins. Evening: Results posted for New Artist competitors. The Young Artist’s Harp Competition takes place every two years in conjunction with the Young Artist’s Harp Seminar. The next competition will take place July 4–7, 2018. The competition takes place on the campus of Kenyon College, in Gambier, Ohio. (Read more about our location). The preliminary video entry deadline is May 1, 2018. Prizes will be awarded from $75–$1,000, or winners may opt for a scholarship to the Young Artist’s Harp Seminar. Finalists will be invited to compete in person following a preliminary video audition round. The number of finalists selected to compete in person is at the discretion of the judges, but typically includes 6 to 12 competitors in each division. The final round is open to the public and is not behind a screen. Three prizes will be awarded in each division, and a winner’s recital, also open to the public, will take place at the conclusion of the competition. Contestants must be able to perform in the winners recital if selected. It is necessary for us to hold a preliminary round to ensure a minimum standard among competitors. We’ve chosen a video audition format because it best simulates a live performance, even if it means your playing may not be perfect. Although you should strive to record the best performance possible, your video audition will be judged on the overall quality of the performance of the music you choose to present, not solely on the accuracy of your playing. We feel this method will insure the fairest possible preliminary round for everyone. All videos must be submitted electronically. No CDs or DVDs will be accepted. Scroll down for more information about making your video recording. All competitors who enter the competition will receive a comprehensive, constructive evaluation of their video audition from the judges. This is the same judging criteria that will be in place for the final round of the competition. Please note that sound quality will not be judged in the video round, but it will be judged in the live final round. Download a sample of the 2016 Evaluation Form. Competitors of any nationality may enter one of the following divisions, according to the age specifications. Entries must include all the materials listed on application page. Emerging Artist Division—age 19 and under on July 1, 2018. New Artist Division—age 14 and under on July 1, 2018. Preparatory Division—age 11 and under on July 1, 2018. Previous first place winners may not re-enter the same division. Entries must be received electronically by May 1, 2018. Entries received after this date, incomplete entries, or entries that do not comply with the rules will not be considered. There will be no exceptions. Contestants must select from the repertoire choices listed above for the appropriate division. All repertoire must be performed from memory. Preliminary video auditions and live round performances will be scored using our standard evaluation form. Download a sample of the 2016 Evaluation Form. Contestants invited to attend the live final round must perform the same repertoire that they included on their preliminary video audition. There is no overall time limit, except for the Category C free choice selection. 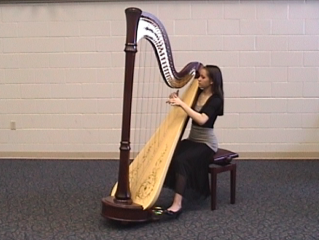 Contestants may pause and put the harp down between pieces, but are not permitted to leave the stage. Contestants who are invited to the live final round may bring their own instrument or use one provided by the competition. The competition will provide a selection of instruments but cannot guarantee a particular make, model, or size. Contestants are responsible for their own lodging and transportation to Kenyon College. 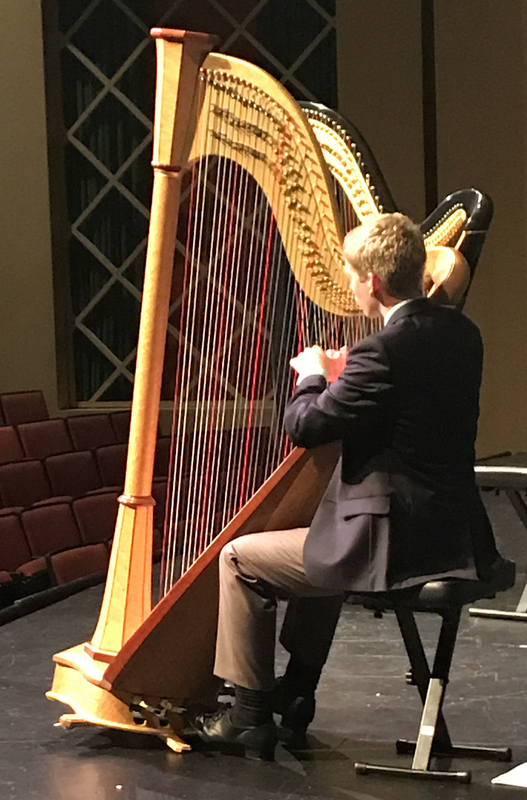 Here are answers to some common questions about the Young Artist’s Harp Competition. We’ll continue to update this FAQ leading up to the competition. Contact us directly if you have a question that isn’t addressed here. How does the Dropbox procedure work? Once we have received your application and entry fee, we will share a Dropbox folder with you where you can upload your video audition file. Most of our entries in the past have required between 1 and 2G of space on Dropbox, depending on your division. Please be sure that you have that much room in your Dropbox account for uploading your video. If not, you will need to reduce the file in some way, or increase the size of your account. Even if you are not ready to submit your video now, please consider submitting your application and fee before May 1, so that we can share the Dropbox folder with you. That way, you will be able to easily upload your video by May 1 without waiting for us to share the folder. Can I play either lever or pedal harp in the Preparatory Division? Yes. As long as you perform the required repertoire, you may play any type of harp. Do you have an example of the Evaluation Form? Yes. Download a sample of our 2016 form here. What time zone applies to the deadline for entries on May 1? All times are given in Eastern (New York City) Time. Can I enter the competition even if I’m not planning to attend the Young Artist’s Harp Seminar? Yes. The competition is open to harpists of any nationality who meet the age requirement. 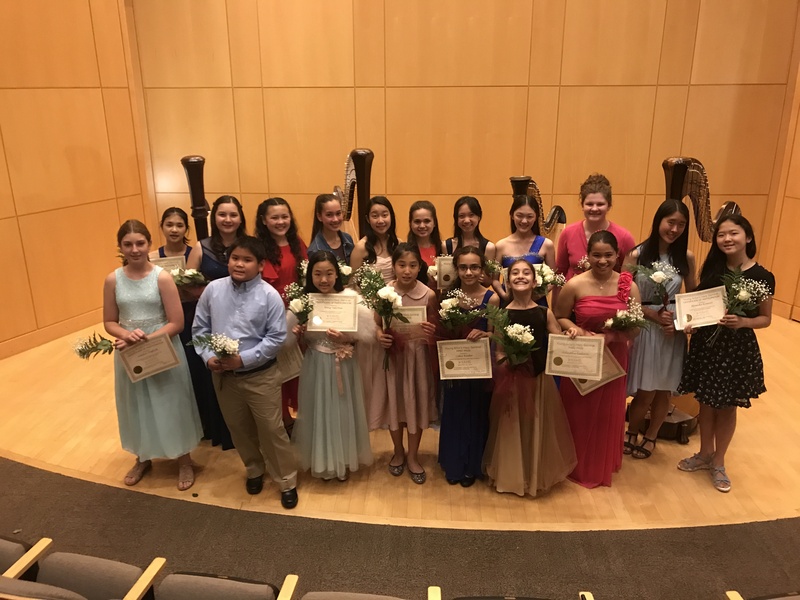 The Young Artist’s Harp Competition and the Young Artist’s Harp Seminar are held consecutively for the convenience of those wishing to attend both events, but it’s not mandatory. I’m not sure how to set up the camera angle to record my video audition. What do you mean by “clear view”? Can you send me information about the Young Artist’s Harp Competition? No. All the information we have is on this website. We encourage you to print these pages to share with your teacher. Is lodging provided for competitors? No, competitors are responsible for their own lodging and transportation to Kenyon College, in Gambier, Ohio. Early dormitory access for an additional fee may available for competitors traveling alone who are also attending the Young Artist’s Harp Seminar. May I choose a piece from the A or B category list for my free choice? Yes, as long as you meet the requirements for the A and B categories you may choose another required repertoire piece for your free choice. Can I perform different music in the live final round than I included on my preliminary video audition? No. If you are invited to the live final round, you must perform the same music that you included on your preliminary video audition. Yes, all must must be performed from memory, both in the preliminary video audition and in the final stage. Can I perform repertoire in any order? Yes, as long as you perform the required repertoire in one sitting, it may be performed in any order. Can I make modifications to the music? Contestants will not be penalized for reasonable edits of the printed music that add to someone’s interpretation of the piece (ie: eliminating or adding notes to a chord, embellishing trills, etc.). Lever harp contestants will not be penalized for modifications that adapt a required repertoire piece from pedal to lever harp. The purpose of the video audition is to ensure that finalists selected to compete in person meet a minimum standard of ability. Your video audition must include a performance of all the required repertoire in one sitting, as if you were giving a live performance. You may perform the repertoire in any order. You may not stop or restart the camera once you begin recording or edit the video in any way. However, you may record your complete performance as many times as you wish, and submit the best one. No one is permitted to speak, appear on camera (except the harpist being recorded), or applaud during your performance. You may pause briefly, put the harp down between pieces, or check tuning as you would in a live performance, however the recording must not stop. There is no time limit for your video performance, however your Category C free choice selection must not exceed the time limit for your division. The camera must be set up to include a full frame of the entire harp and harpist, providing a clear view of the harpist. Do not shoot through the strings. Do not adjust the frame once you have begun recording. (See the FAQ for a photo example of a good camera angle.) Do not shoot sideways. The judges will review your video using the evaluation form (see FAQ) to determine if you have a thorough knowledge of the music you are presenting. Your video should be recorded in a quiet setting free from any distracting noise that would prevent the judges from fully appreciating your performance. You should use the best equipment possible, but it is not necessary to submit a professionally produced video; home video equipment is adequate if you feel it gives a good representation of your performance. Your video audition will not be judged on sound quality or stage presence, however note that these categories will be judged in the live final round. All video auditions must be submitted electronically using Dropbox. (Visit www.dropbox.com to install the program on your computer.) Once we have received your application, you will receive an invitation to share a Dropbox folder with us where you can upload your video audition. Do not label your video audition in any way. Do not include titles of pieces, your name, or text of any kind on your video. Most entries require between 1 and 2G of space on Dropbox for your video submission. Please be sure that you have that much room in your Dropbox account for uploading your video. We recommend that you test the procedure well in advance, so that you don’t experience technical delays that prevent you from meeting the entry deadline. Even if you are not ready to submit your video right away, please consider submitting your application and fee before the May 1 deadline so that we can share the Dropbox folder with you. That way, you will have ample time to upload your video without waiting for us to share the folder. Entries are now closed for the 2018 competition! Check back for details about the 2020 competition in summer, 2019. Click the button to submit the online entry form by 6:00 p.m. ET May 1, 2018. Pay your Entry Fee by 11:59 ET on May 1, 2018. Once we have received your online application, you will be invited to share a private Dropbox folder where you can upload your video audition recording. Please visit www.dropbox.com to install the Dropbox application. We recommend you do this well in advance so that you can become familiar with the procedure and how to use the application. Receipt of competition entries will be confirmed via e-mail, at the primary email address provided on your entry form. Please inquire if you have questions about the application process. Contestants in each division must perform three pieces from memory, choosing from the requirements listed below. There is no overall time limit, except for the Category C free choice selection. Contestants may pause and put the harp down between pieces, but may not leave the stage. When not specified, contestants may choose any edition of a piece listed. Contestants are encouraged to choose a program that is varied in style and tempo and that represents an appropriate level for their division. Judges will include a difficulty level rating in their score. (C) Free choice selection of the contestant’s choosing (time limit, 12 minutes) Free choice composer cannot be the same as A or B choice. *Free choice selections should be taken from the standard solo classical harp repertoire (i.e., no pop or jazz) and should be of equal or greater difficulty than the pieces listed in the A and B categories for each division. Only one work may be chosen in the free choice category; one or more movements of a multi-movement work may be performed, provided the total timing does not exceed the limit for the division. Free choice selections must be for solo harp: do no choose a piece that requires accompaniment. **Clarification: Contestants who choose Etude #2, from Etudes for Harp by J.S. Bach/Grandjany from Category A are permitted to choose a composition by Marcel Grandjany as their free choice selection.